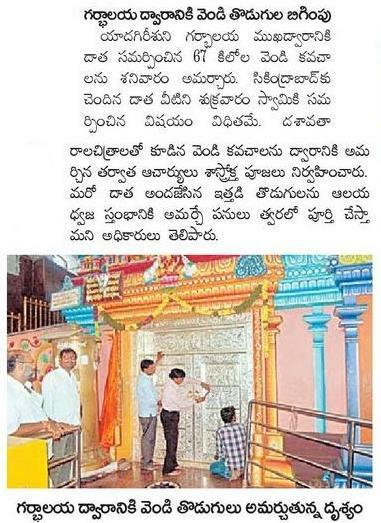 Lord Sri Laxmi Narsimha Swamy devotee Sri Gandaiah, from Secunderabad donated 67 Kgs Silver covers for the Main temple's entrance doors on 07-10-2011 to the temple authorities alongwith his family members, which fixing works has been completed. 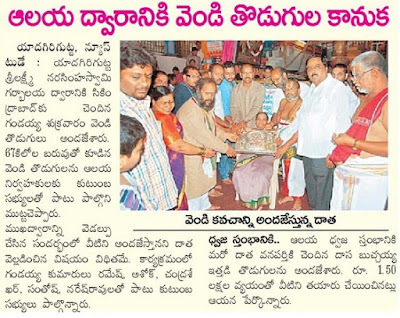 One more devotee Sri Dasa Buchaiah, from Wanaparthy donated 1.5 lakhs value Brass cover for the Dwajasthambam of Yadagirigutta temple. Source : Eenadu epaper 08, 09-10-2011. Mr. Pankaj Dwivedi, who recently appointed as Chief Secretary of AP State has visited SLNS Devastanam Yadagirigutta on 2nd October 2011 along with family members. 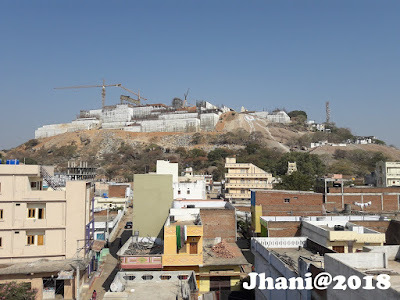 Priest of the temple gave him special blessings and he perform various special pujas in main temple, he told to the press that, he likes very much Yadagiri Laxmi Narasmiha Swamy, Since yadagirigutta is very near to capital city and growing day-by-day, its observed that this is one of temple which is developing rapidly in the state and he will support always for this temple's development. Nalgonda Dist Collector Muktheshwar Rao, SP Sivashanker Reddy, Joint Collector Neetu Kumari also attended there.